How many CSX Cabooses are left in Chessie System paint? I saw one of them in Cordele, GA about a week ago. It didnt even have CSX reporting marks, but it was clearly in service as it was coupled to a CSX Geep and a woodchip hopper. I know this might be just a bit off topic but in the late 1970's the Traverse City run always had a "wide-vision" caboose still in full C&O paint. We used to camp at "Healy Lake"( just north of Kaleva), every year back then. It was really neat. Train went right by the campground. Usually GP-9's or 35's. I think the '38's were too heavy for that subdivision. Although I don't know why. That track there was pretty solid! Cinder ballast could have been the deciding factor? IIRC there's a Chessie caboose or two floating around the ex-PH&D line. Caboose 900054 (wide cupola) was here (Port Huron area) about five years ago (June 2007). It may or may not still be here. There was also a bay window caboose that was hanging around. I don't have a number for it (can't find a picture of it on my hard drive ). 2ish Toledo 900055 + ? Also floating around earlier in that decade was 903897 and CSX painted 904091. Grand Rapids 903318, 903101 (904151 scrapped, I believe), 903109 was also based here for a while, not sure where it is now. Some of the other ones from the 2005 list have been reported at various places since then, but I haven't seen any recent reports. Obviously cabs from Saginaw and Muskegon have gone elsewhere or been scrapped. Until the late 90s, Saginaw was the home base for one of the very last C&O "Grand Rapids" style ACF cupula-center cabooses, from the 40s. I know there is at least still one Chessie bay window and 1 or 2 widevisions in Grand Rapids. The service track job has been using an Operation Lifesaver baywindow recently, though. The C&O Yard in Fostoria hosts two. One bay window, one cupola. The 904044 bay window B&O / Chessie caboose is still in Lincoln Yard in Wixom, though it's in rough shape. It has broken windows and some poorly-done graffiti on it. There's a couple different wide vision cabs in Chessie paint used as shoving platforms here in Toledo. Grafitti artists and vandals have done their work though - and they look like absolute crap. Does anyone know anything more about this caboose? 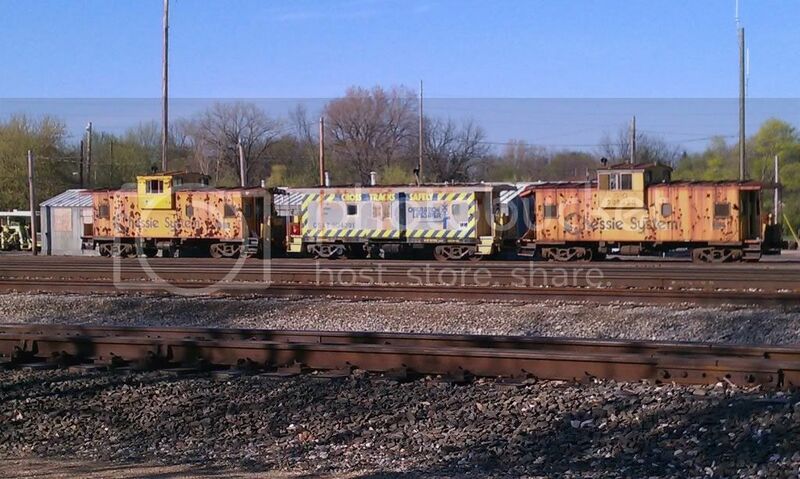 900055 was still in Toledo as of 2016 (by the Jeep Plant and Ann Arbor Yard). 903161 has been donated to Toledo Lake Erie & Western. Still in Chessie paint, which will be restored.